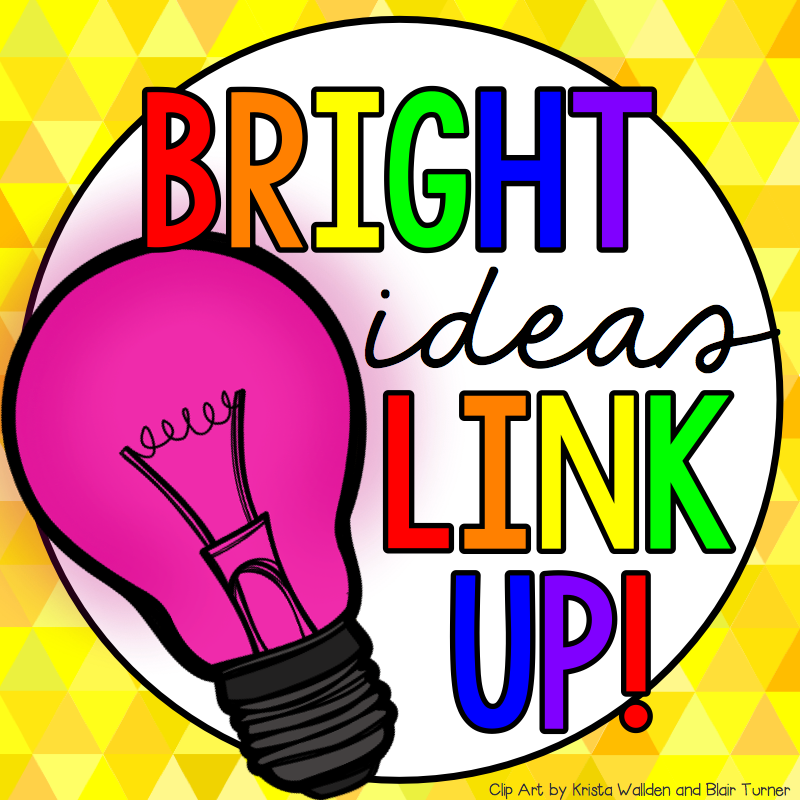 It's time for another Bright Ideas Blog Hop! Are you as excited as I am?! The idea I am sharing today is one that I have been using since I started teaching and will NEVER change. It works out so effortlessly for me that changing it would be the complete opposite of bright! Scenario: Johnny is absent for a couple days... and his work is piling up. In the shuffle, papers fall off the desk or get misplaced. Or.. Johnny doesn't go into your stash of papers from the week to get what he missed. Or sometimes it wasn't a sheet to complete, but instead an assignment on blank paper. He wouldn't know he missed that paper. Another scenario: Susie leaves early for the day or Sammy goes to ESL. Sarah didn't finish her work on time. Now they have papers that they need to finish that get stuffed in some random place in the abyss we call a desk, never to be seen again. Solution: Incomplete Work folder. Sounds like "great, another folder to handle and manage", but I promise you this is easy. And, my incomplete folders have been the same folders for SIX years. And I don't even need to replace them yet! Here's how it works. 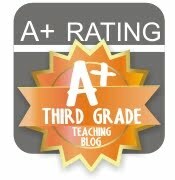 All of my students are assigned a class number. 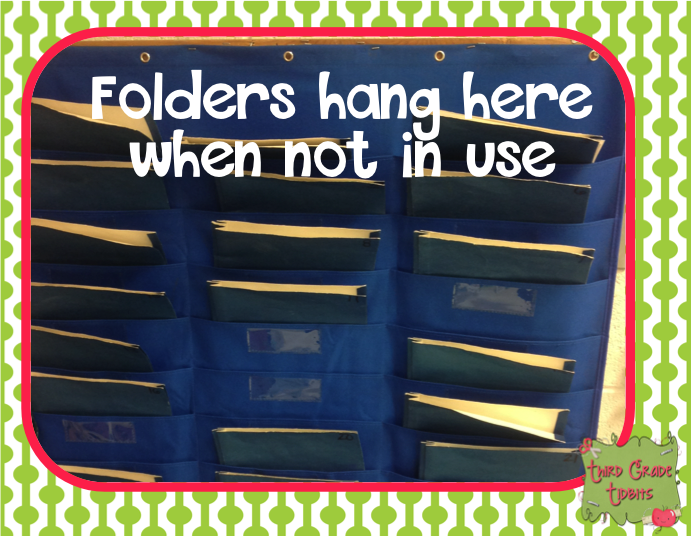 Each folder is numbered and hangs in this pocket chart. This is where the folders stay unless they are needed. When students are absent, their neighbor (the person who sits next to or across from them depending on my seating arrangement at the time) will get their folder out of the pocket chart and place it on the absent student's desk. Any time I pass something out, the responsible friend, puts the paper in the incomplete folder. The folder stays here until the absent child returns to school. 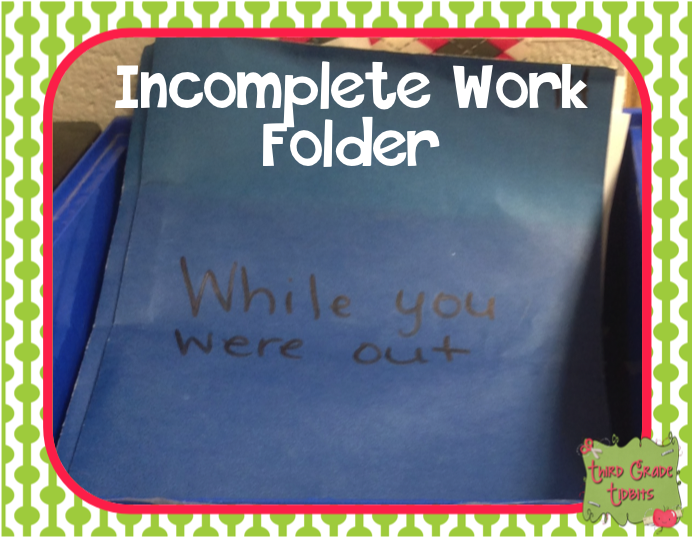 When the child returns to school, they look for any papers that have to go home (spelling lists, newsletters, etc) and place the folder in this "incomplete work" bucket. (This bucket is shelved right next to my turn in work buckets that I shared about last time.) 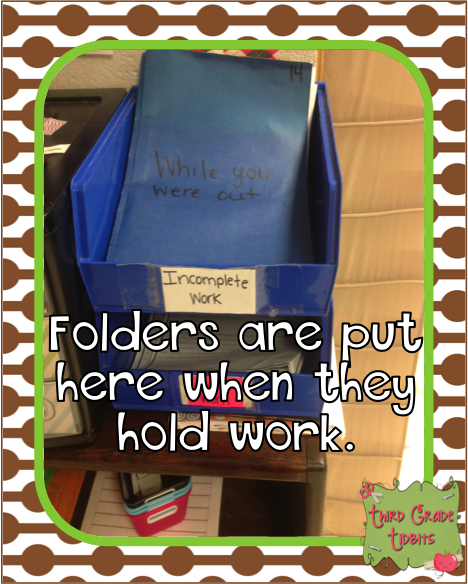 Any time the child has free time, they know to get their folder and get to work. The same thing goes for when a child doesn't finish work. They simply grab their own folder, put the work in it, and stick it in the bucket. When students finish an assignment, they check my turn in drawers to see if the assignment is still in there. If it is, they simply turn their assignment in with the rest of them. 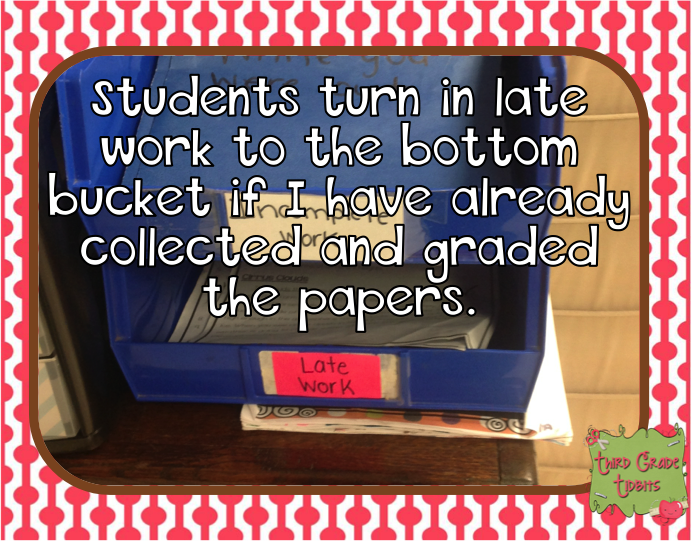 IF the assignment is really late or I have already taken the papers out to grade, students turn the assignment into the late work bucket, which is just below the late work bucket. This has saved me SO MUCH time and aggravation. Students are responsible for their own work and I don't have to worry about me losing or throwing away extra copies. My buckets aren't the fanciest around, but they serve the purpose and save me sanity, and for that, I am super thankful for this bright idea! If you enjoyed this bright idea, consider liking my facebook page! And be sure to check out the link up below for 150 bright ideas! I am awful at remembering to give missed tests and other assignments. I am going to give this a try! I have one folder for "Make up" work and things always get misplaced! I LOVE this idea - I even have the pocket chart that I was wondering what to do with since I upgraded my mailbox. I am in LOVE with this idea -- thanks so much! What a great idea! It's always so hard to keep track of student work when they are absent (or if they don't finish on time). Thank you for sharing!